You may have already found your way to my new online shop! If not, simply go back to the Home page and click on ‘Shop’ in the menu bar. I’m slowly getting things added to it – so far there are some jute bags, my two painting project books, and two packs of greetings cards. I have been working away at my Four Seasons on the Stour book, and that will be going into the shop in the next couple of weeks I imagine. In case you are wondering, the payment system used is PayPal, but you do not have to have a PayPal account in order to make a purchase. You can select to pay by debit or credit card, and PayPal will still handle the transaction. 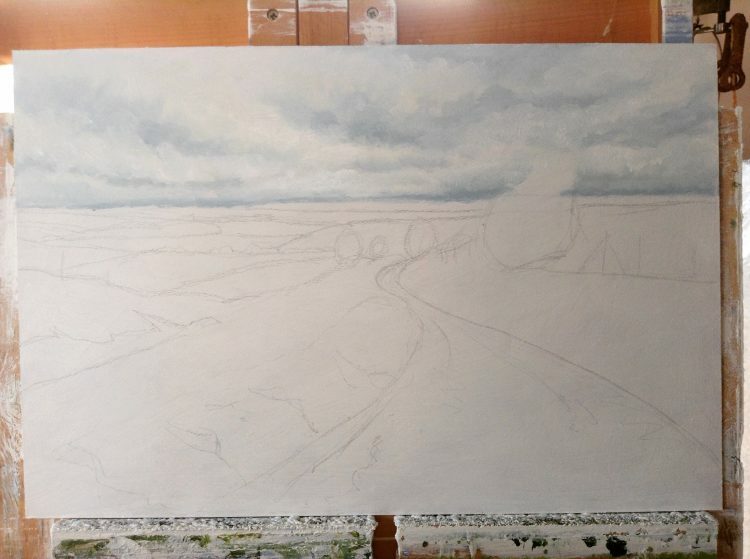 In my Studio: I’ve been making a start on The Ridgeway VI. As I explained in my plans for the year I am not starting On the Edge: The North Sea Project until about April, but I’m going to spend some time catching up on these paintings. This is as far as I’ve got! As you can see, a long way to go . . . . .! and prepared a first little plate. 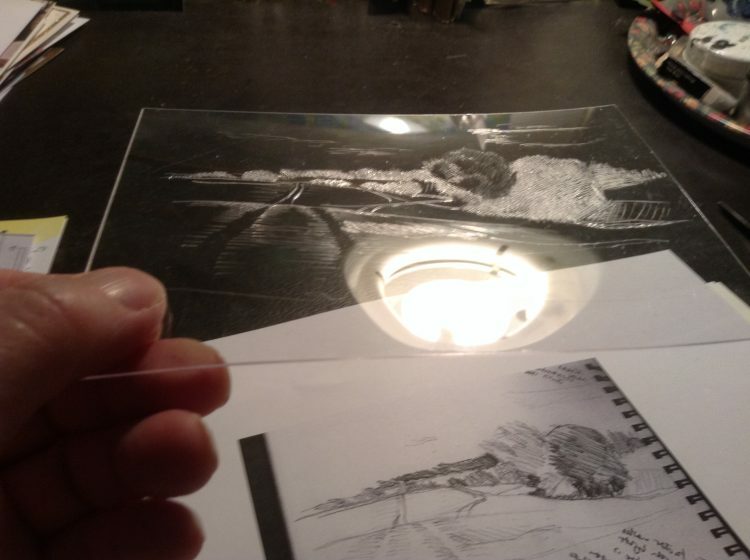 The plates are very small, and the kit provides some that are laminated card, some acetate and one copper. I started with an acetate one, and drew into it a tiny landscape taken from a drawing I did of the Gosbecks fields near where I live. That is as far as I’ve got at present! I need to re-watch the YouTube videos showing how to print a drypoint without a press again before I continue. It’s been a funny week as I started it in the Day Unit of our local hospital having a laryngoscopy to investigate a problem I’ve been having with my voice – which thankfully turned out to be nothing like as serious as was first suggested. Graham collected me from hospital as I’d had a general anaesthetic, and I stayed with him for a couple of nights to recover. 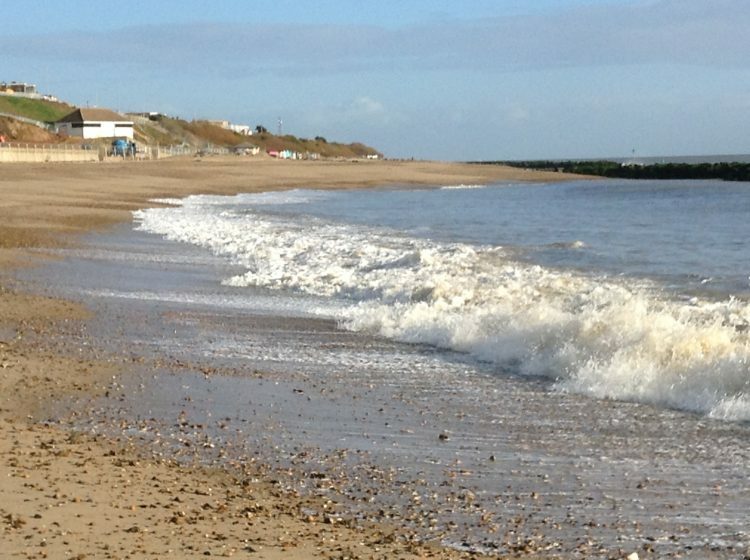 This was the beach just down from his house on Wednesday morning – the sun was quite warm but the sea was roaring after the very high tides and strong winds at the weekend. Apart from a sore throat, where all the instruments were shoved down it, and feeling very tired and dopey still from the anaesthetic, I’m now pretty much back to normal and looking forward to getting back to singing! I haven’t had a lot of energy – or time! 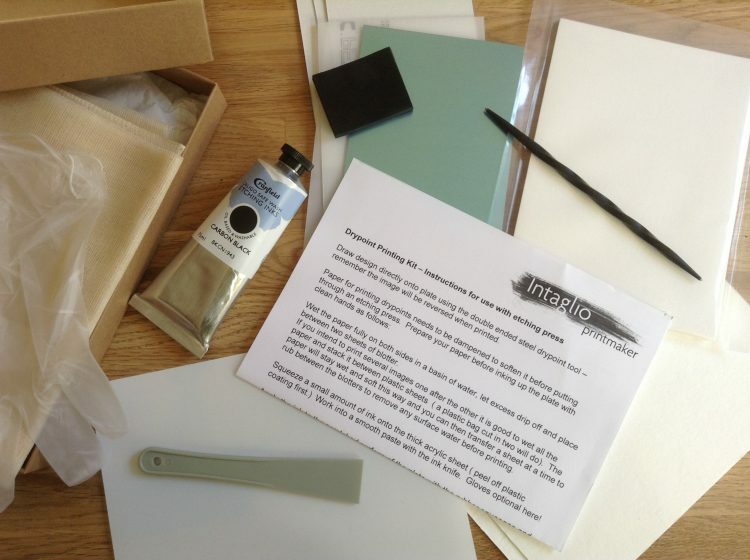 – for making painting or printmaking progress this week, though, and I’ve mostly just been doing little bits and pieces! ← Starting the New Year!